The Anglican Chorale of Ottawa (ACO) is an unusual Canadian Church choir in that we have no church building to call our own, and we have actually sung more services in the UK than in Canada. There are about 30 members of the choir, ranging in age from 18 to 80. Every other year we travel overseas for two weeks. For the first 4-5 nights we usually stay in a private school in a rural area where we rehearse intensely, and sing at a local church or cathedral. Then we move to a “touristy” location where there is more time to spend seeing the local sites (e.g. 2008 – Cambridge). 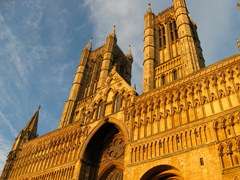 The second week we are the "choir-in-residence" at one of the UK Cathedrals. 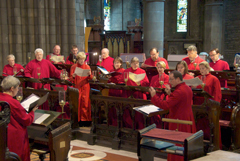 The Chorale sings the daily services while the usual Cathedral choir vacations, thereby allowing a centuries-old Choral tradition to continue uninterrupted. Every trip has a “Mystery Tour” where we go on a surprise expedition for the day. 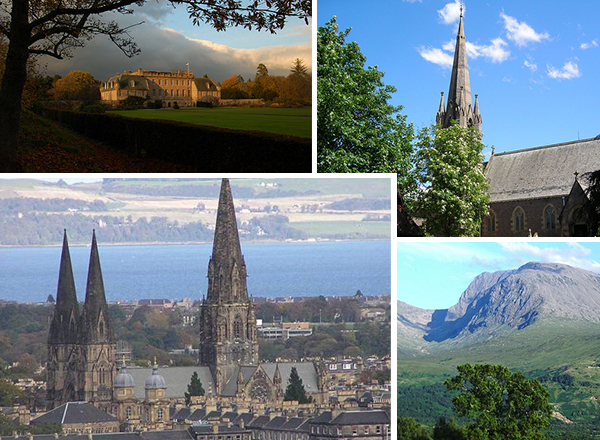 In 2010 our “Mystery Tour” included a falconry, a seaside town, and a tour of the Aberlour distillery. The trip always includes unique experiences that an average tourist would not have. For example, in 2006 after Canterbury Cathedral closed for the evening we sang alone in the Quire, by candelight. In 2006 the Chorale sang Remembrance ceremonies at the Canadian Vimy Memorial in France, and at the Menin Gate in Ypres, Belgium. 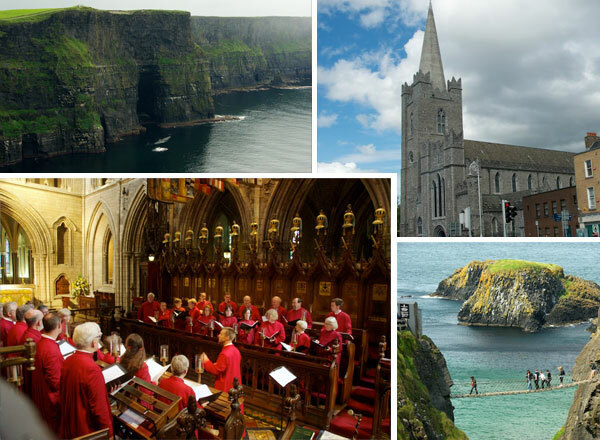 In the ACO's 2012 trip to Ireland, we sang at Christchurch and St. Patrick's Cathedrals in Dublin and visited such sites as the Giant’s Causeway, Antrim Trail, and the Cliffs of Moher (near Galway). 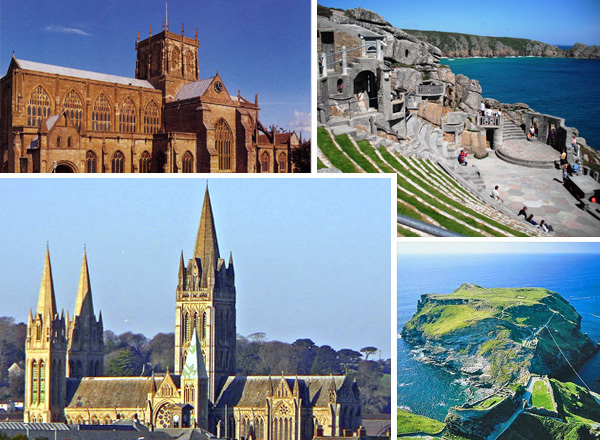 We are currently planning our August 2014 trip to the UK and Wales where we will sing at Brecon, Gloucester, Hereford, and Worcester Cathedrals. 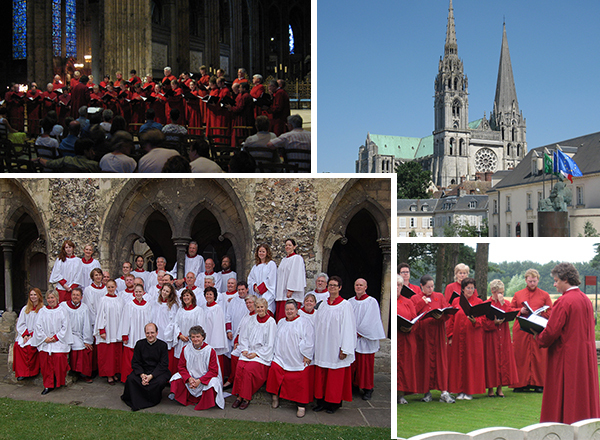 When we are not travelling, the choir rehearses infrequently in Ottawa, and sings approximately three evening services a year at various parishes in the Ottawa region, some of which would not otherwise be able to celebrate Choral Evensong. 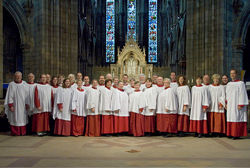 The Anglican Chorale of Ottawa (ACO) is a registered charity. Donors will receive an official tax receipt, together with our heartfelt thanks. Why do we need help? 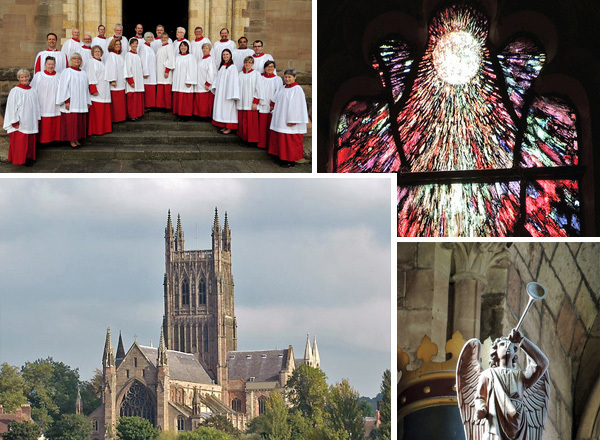 We want to make it possible for young singers to have the experience of singing in the UK Cathedrals, and be part of the traditions that have continued for hundreds of years. Also, the choir provides a musical environment that provides opportunities for these singers to improve as all-round musicians, and to take these skills and experiences back to their own choirs. We do everything we can to keep our costs to a minimum so as to make our trips affordable for as many as possible - we often stay in choir school dormitories, and members of the Chorale's Organising Team do thousands of hours planning work as unpaid volunteers. Even with all our careful spending, travelling to the U.K. in summertime is increasingly expensive and tour costs are approximately $4,000 per choir member, once air fare, accommodations, meals and a share of the group expenses (e.g., buses, director fees, music) are tallied. Putting forward this amount of money can be difficult for students and those who have not yet reached their income potential. With your help we can continue to provide some financial assistance for the younger Choir members, and any member with a demonstrated need. The Chorale has established a support fund for its younger singers, or those facing financial hardship. Although many current and former choir members make a significant contribution to this fund, your contribution would allow us to offer this experience to more choristers who have very limited resources of their own, but so much to offer the Choir. Please go to the fabulous CanadaHelps.Org website, to make secure on-line donations to the Anglican Chorale of Ottawa. The Anglican Chorale would like to thank everyone who has donated their time and talent to making this such a high calibre musical organization. No organisation consisting of volunteers can be this successful without strong support from behind the scenes. This includes the organising team, the Music Directors who share their immense talent and encourage us to be the best we can, and the congregations who attend our Evensongs. We add a special thanks to those who have supported our young artists through donations to the Financial Assistance Fund. The Chorale is pleased to acknowledge a grant from the A.E.J. Fulford Trust of the Anglican Foundation in support of our younger singers who reap the many benefits of exposure to, and keeping alive, the Anglican Choral traditions in Canada. We are extremely grateful to those churches who have allowed us to rehearse in their beautiful facilities : Christ Church Cathedral, Ottawa St, Martin’s Anglican, Ottawa St. Matthew’s Anglican Ottawa We are equally grateful to those who have lent us music over the years. St. Matthew’s, Christ Church Cathedral, St. George’s in Kingston, Christ Church Deer Park in Toronto, Canadian Centennial Choir, and Cammac. 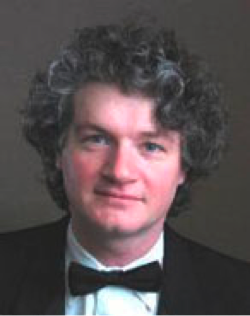 Andrew McAnerney 2015-present Andrew is the Director of the Choir of Men & Boys at Christ Church Cathedral Ottawa, Artistic Director of the Studio de musique ancienne de Montréal, and Conductor of the Cantata Singers of Ottawa. Andrew was raised in the Anglican choral tradition as a boy chorister at Cirencester Parish Church and Gloucester Cathedral. After studying music at Magdalen College, Oxford, he was appointed a tenor lay clerk at St George’s Chapel, Windsor Castle before moving to London and pursuing a musical career working as a conductor, soloist, consort singer and arranger. 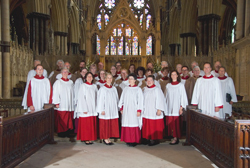 In addition to touring Europe singing sacred music with the Tallis Scholars, Brabant Ensemble and Contrapunctus, career highlights have included radio and TV broadcasts (including 18 appearances on BBC Radio Three’s Choral Evensong), singing at various royal events including the wedding of Prince Edward in 1999, and taking part in hundreds of choral services in churches, chapels and cathedrals throughout the world. 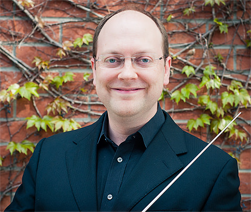 James Caswell 1995-96, 2007-2014 is a graduate of the University of Ottawa with degrees in music and education, and is in demand in the National Capital Region as conductor, accompanist and clinician. James is the vocal performance teacher in the Arts Canterbury programme at Canterbury High School in Ottawa. Mr. Caswell was the Music director of the Canadian Centennial Choir from 1994 -2009. From 1992 to 2001 James was the Director of Music at First Baptist, and the accompanist for the University of Ottawa Choir from 1991 to 1998. As a guest conductor, he has appeared with the Cantata Singers of Ottawa, the Ottawa Choral Society and the Opera Lyra Ottawa Chorus. He has also appeared as organist with the Ottawa Symphony Orchestra. In 1998, he was a participant conductor at the Oregon Bach Festival, under Helmuth Rilling. Stephen Candow was co-director in 2008 and 2010 with James Caswell. In 2012 Stephen will join the ACO as the organist. Stephen is a native of St John's, Newfoundland, holds a conjoint BMus/BMusEd from Memorial University and a MMus in performance from the University of Toronto. 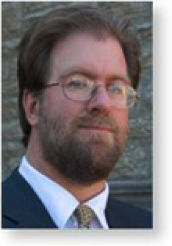 In 1998 Stephen won the post of Guinness Organ Scholar at Christ Church Dublin, Ireland. Following his year in Dublin, he went on to become the assistant organist in Canada's Methodist Cathedral, Metropolitan United in Toronto. While there, he was also the accompanist for the renowned Toronto Mendelssohn Youth Choir. Stephen returned to Newfoundland in 2002 where became organist and choirmaster of St Michael and All Angels Anglican Parish, an accompanist for the Newfoundland Symphony Youth Choir and chair of the Royal Canadian College of Organists, Avalon Centre. In 2005, he moved to Ottawa to take up the prestigious post of Director of Music at St Matthew's Anglican Church. In 2010 Stephen and his family returned to Newfoundland. Matthew Larkin Our Music Director from 1996 to 2006, Matthew Larkin has led the Chorale on five U.K. Tours, and for 10 years in our offerings to Churches here in the Ottawa area. A native of Oxford, England, Matthew Larkin moved to Canada shortly before his sixth birthday. Matthew received his early musical training as a boy chorister at St. George’s Cathedral (Anglican) in Kingston, Ontario, becoming assistant organist there while still in high school. He later studied with John Tuttle at the University of Toronto, and was Organ Scholar of Trinity College. He also attended the Royal College of Music, London, UK, where he was a student of Nicholas Danby. Matthew began his professional career as a choral conductor in Victoria, BC, where he was appointed Organist and Choirmaster at the Church of St. John the Divine in 1988. He moved to Ottawa in 1995 to take up a similar position at St. Matthew’s Church, where he built the St. Matthew’s Boys’ Choir into an ensemble of national importance. In the 2002-2003 academic year, he served as Director of the Choir of Men and Boys at St. James’ Cathedral, Toronto. 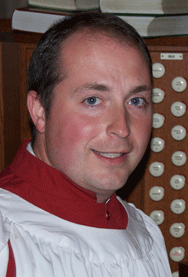 In September 2003 Matthew was appointed Organist and Director of Music at Christ Church Cathedral, Ottawa. 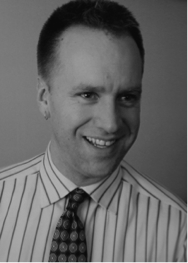 While in Ottawa, Matthew has served as Director of the Ottawa Opera Boys’ Choir (1999-2002), Founding Director of Euphonia Chamber Choir (2001-2004) In June 2005, Matthew began duties as Director of the Ottawa Choral Society, the national capital region’s most historic choir. Matthew enjoys an enviable reputation as a recitalist, accompanist, composer and recording artist, and has appeared as soloist with many of Canada’s orchestras and in concert halls across Canada. Bruce Kirkpatrick Hill was Associate Director of the Anglican Chorale of Ottawa from 2003 to 2006. Bruce was on three U.K. Tours with the Chorale - Wells in 1998, Exeter in 2004, and Canterbury in 2006. A native of Victoria, British Columbia, Bruce Kirkpatrick Hill completed his MA in musico logy at the University of Victoria before moving to Toronto for doctoral studies at the University of Toronto. He left his job as Organist at St. Andrew's Cathedral in Victoria, and for seven years was Organist and Choirmaster at St. Andrew's Anglican Church, Scarborough, and College Organist for St. Michael's College on the University of Toronto campus. In 1997 he he became Organist and Director of Music at Christ Church Deer Park in Toronto. He was the accompanist for Pax Christi Chorale, and the rehearsal accompanist for the Tafelmusik Chamber Choir. Bruce was also a member of the award-winning Exultate Chamber Singers. Bruce Kirkpatrick Hill died on Sunday, March 18, in his 48th year. We will all miss his energetic, lively, gregarious presence that radiated an equal love for music and people. 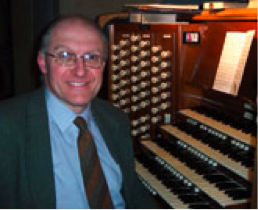 Andrew Teague founded the Anglican Chorale of Ottawa in 1994, and was a music director and/or organist until 2002. Andrew was the Organist & Choirmaster at St. Matthew's Anglican Church in Ottawa during the early nineties. He was founder member of the committee of the South Eastern Ontario branch of the Royal School of Church Music. On returning to the UK in 1994 to take up the post of Director of Music at St. Elphin's School, Andrew also became Organist & Choirmaster at St. Peter's Church in Nottingham. 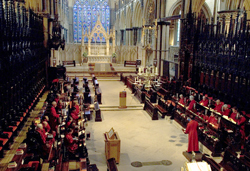 In January 2003 he was appointed Organist and Master of the Choristers at Bradford Cathedral. 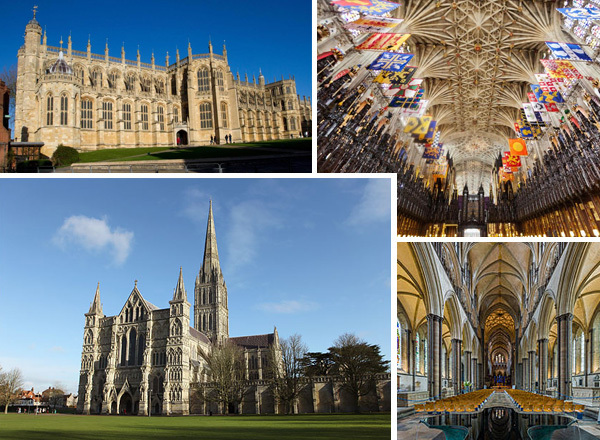 Originally trained at Oxford and Cambridge universities, he has also held posts as Organist in Brighton and Oxford. 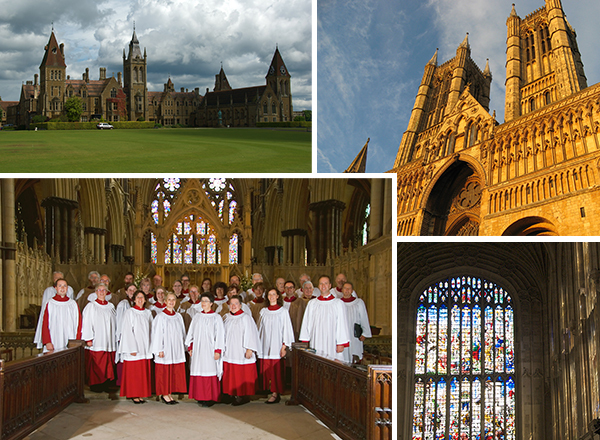 The following is some of the music we have sung in Evensong, Matins, and Eucharist services. Today there are approximately 30 members of the choir ranging in age from 18 to 80. 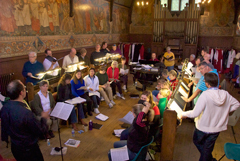 Almost all choir members sing in other church choirs, university choirs, or community choirs. Some members of the choir are professional musicians, music teachers, or they are taking a degree in music. Some of the members are Anglican, and many are not. One thing we have in common is that we enjoy making great music together. We limit the number of members because of the size of the choir stalls in British cathedrals, and the number of people with luggage that you can fit on a tour bus. • Strong singers with above average sight reading skills, who already understand music basics (e.g., dynamics, phrasing, where to finish consonants). The Chorale sings a lot of Anglican chant, so knowing how to do that definitely helps (but is not a requirement). • People who remain cheerful in the face of the challenges that inevitably arise (and if you like a visit to a pub, or a game of euchre, that is also an asset). Here is the process to audition for the choir. (1) Come to a rehearsal. See if this choir is what you are looking for. (2) Audition. The audition is informal, and usually will require some sight singing, and a piece of your choice. You might also be asked to sing with several other members of the choir to assess the blend. (3) Chat with a member(s) of the organizing team who will discuss with you the commitment involved in being a choir member, the costs of taking part, the up-coming rehearsal schedule and the itinerary of our next overseas tour. You will also have an opportunity to raise any questions you may have about the choir and how it works. If you would like to join us, please send an e-mail to trishbrooks@sympatico.ca to determine if we are currently recruiting for your voice section, and to arrange an appointment. We are proud that, over the years, our choir has included members of all ages, including choristers as young as nine years old. However, the composition of the choir varies from season to season depending on such considerations as the type of music we will be singing and the schedule demands we will be facing on each upcoming trip. At present, we are not auditioning children for membership in the choir, but have instead been focusing our most recent recruiting efforts on young adult singers, several of whom are already making substantial and welcome contributions to the choir. Contact the Organizing Team at: acochoir@gmail.com.